In September, Jen from Vibrant, Vivacious, and Veracious Beauty was my featured blogger. You can read that post and see other past featured blogs under the "blog of the month" label! Being my blog of the month gets you a designated blog post, a sidebar button, and a mention on my Twitter account. The sidebar button stays up all month long. I don't believe in necessarily making bloggers pay for advertising and I'd much rather show you blogs that I really enjoy reading. And I hope you end up enjoying them too! 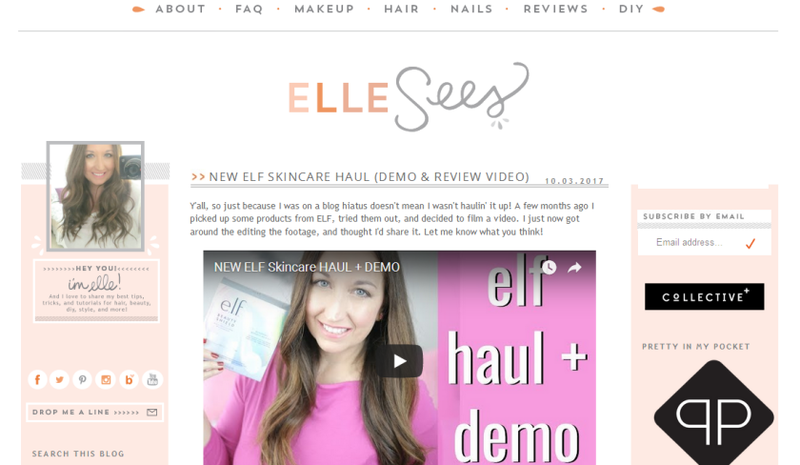 This month, I'm featuring Elle from Elle Sees. I've been following Elle for some time now. I can't remember if I followed her blog first or her Instagram. All I know is that I'm happy to follow both! She's a real sweetheart and I can never have too many southern bloggers on my feed. Makes me think of home every time I hear a "y'all"! Elle covers mostly beauty, but she's been talking more about mental health recently too...which I can absolutely relate to and I'm sure many of you can, as well. I hope y'all check her out and feel free to let her know I sent you. For my Canadian readers, I want to wish you all a wonderful Thanksgiving weekend! I'll be taking until Tuesday off from blogging to enjoy the holiday weekend. I've said it before and I'll say it again- it's pretty spiffy having two Thanksgivings each year. Hope you all have a great weekend!